Simpalm Featured as a Top App Development Company in DC on Clutch! At Simpalm, we are a leading mobile app development company providing responsive design and development solutions for our wide range of clients, from startups to enterprises. Our experienced team members work extremely hard to deliver excellence to our clients – we work to completely understand our clients’ needs and goals, and we build applications to meet and exceed those goals. 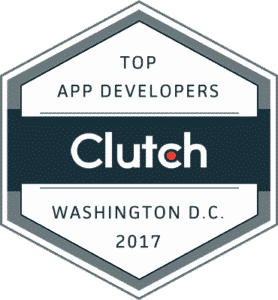 We work with clients all over the world, but our home base is in Washington, D.C. As a top development company in the area, we have consistently been featured in research on the Top App Developers in D.C. by Clutch, a ratings and review company local to the area. Last week, Clutch released the results of the Top App Development Companies in D.C. for 2017, and we made the list! A leading B2B research, ratings and reviews firm, Clutch evaluates companies on their ability to deliver, market presence, and experience. Clutch analysts speak directly with past and current clients to conduct full-length verified reviews for each company’s profile. These reviews are used by prospective buyers when looking for a new development partner. So far, we are proud to say that our Clutch profile features several positive reviews from our clients. We are happy to see that our hard work is paying off, and that our clients are pleased with the results of our work. We look forward to growing our Clutch presence!